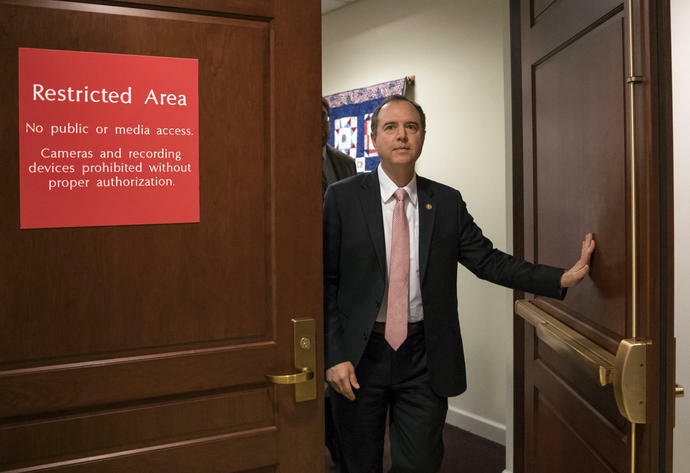 WASHINGTON (AP) -- The House intelligence committee will launch a broad new investigation looking at Russian interference in the 2016 election and President Donald Trump's foreign financial interests, Chairman Adam Schiff announced Wednesday, moving ahead with the aggressive oversight that Democrats have promised now that they are in the majority. Schiff said the investigation will include "the scope and scale" of Russian intervention in the 2016 presidential election, the "extent of any links and/or coordination" between Russians and Trump's associates, whether foreign actors have sought to hold leverage over Trump or his family and associates, and whether anyone has sought to obstruct any of the relevant investigations. The announcement came one day after Trump criticized "ridiculous partisan investigations" in his State of the Union speech. Schiff dismissed those comments Wednesday. "We're going to do our jobs and the president needs to do his," Schiff said. "Our job involves making sure that the policy of the United States is being driven by the national interest, not by any financial entanglement, financial leverage or other form of compromise." The California Democrat also announced a delay in an upcoming closed-door interview with Trump's former fixer and personal lawyer, Michael Cohen, "in the interests of the investigation." The interview was originally scheduled for Friday. It will now be held on Feb. 28, Schiff said. Schiff said he could not speak about the reason for the delay. Hours after the meeting was pushed back, a document was filed, and then deleted, under seal in the criminal case against Cohen brought by special counsel Robert Mueller's office. The court's docket did not contain any details about the nature of the document. A later notice said the document had been "incorrectly filed in this case." Special counsel spokesman Peter Carr declined comment, as did Lanny Davis, an attorney for Cohen. The intelligence committee also voted Wednesday to send Mueller the transcripts from the panel's earlier Russia investigation. Republicans ended that probe in March, concluding there was no evidence of conspiracy or collusion between Russia and Trump's presidential campaign. Democrats strongly objected at the time, saying the move was premature. Since then, both Cohen and Trump's longtime adviser Roger Stone have been charged with lying to the panel. Cohen pleaded guilty in November to lying to the House and Senate intelligence committees about his role in a Trump business proposal in Moscow. He acknowledged that he misled lawmakers by saying he had abandoned the project in January 2016 when he actually continued pursuing it for months after that. Stone pleaded not guilty to charges last month that he lied to the House panel about his discussions during the 2016 election about WikiLeaks, the anti-secrecy group that released thousands of emails stolen from Democrats. Stone is also charged with obstructing the House probe by encouraging one of his associates, New York radio host Randy Credico, to refuse to testify before the House panel in an effort to conceal Stone's false statements. Schiff has said Mueller should consider whether additional perjury charges are warranted. The committee had already voted to release most of the transcripts to the public, but they are still being reviewed by the intelligence community for classified information. Mueller requested Stone's interview transcript last year and the panel voted to release it in December. Schiff wouldn't say whether Mueller had requested other transcripts, but noted that the committee had voted to withhold a small number of transcripts from the public and also that some witnesses had been interviewed since then. The transmission of the transcripts to Mueller, expected immediately, will give him full access to all of the committee's interviews. Among the transcripts are interviews with Trump's eldest son, Donald Trump Jr.; his son-in-law, Jared Kushner; his longtime spokeswoman, Hope Hicks; and his former bodyguard Keith Schiller. There are dozens of other transcripts of interviews with former Obama administration officials and Trump associates. Democrats also opposed a Republican motion at the meeting Wednesday to subpoena several witnesses. Republicans said they were witnesses who Democrats had previously wanted to come before the panel. A Republican aide said that witness list included FBI and Justice Department officials involved in the Russia investigation and others who could shed more light on research by former British spy Christopher Steele. The aide spoke on condition of anonymity because the committee's business is confidential. Steele's research was funded by Democrats and later compiled into an anti-Trump dossier that became public.